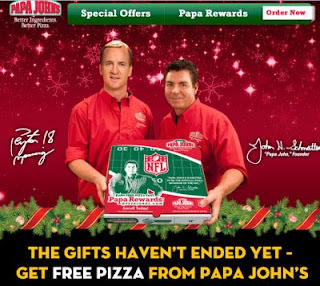 Order $12 or more from PapaJohns.com before January 7th, then your next pizza will be on Papa! Just order $12 worth on your order & enter the code: "PAPASGIFT" at checkout. Your NEXT Order one pizza will be FREE! You'll have to order & enter the free code "PAPASGIFT" by January 7th, 2013. AFTER you have received your 25 bonus points, use the regular Papa Rewards promo code (25PAPA) to redeem the points for a FREE PIZZA by end of day on Sunday, 1/20/13.